The participants of S.T.E.A.M.Fest show off their best costumes and gadgets. I am the first to classify myself as a geek. I wear the moniker as a badge of honor, rather than one of shame. But I can’t say much about about Bioshock or Skyrim – video games, right? – or “Akira,” or most other anime. Every year, at Dragon*Con, when I get nearly overrun by throngs outfitted in goggles, petticoats and pocket watches or waving mechanical arms, legs and weaponry, I simply snap photos in awe. This is where S.T.E.A.M.Fest 2012 comes in. S.T.E.A.M.Fest is the Steampunk Theater, Entertainment, Arts & Music Festival. It began in 2008 by the Academy Theatre in Avondale Estates, a small community adjacent to Atlanta, to celebrate the “artistic ability of those who toy with alternate history and retro-futurism." I was at the steampunk-centric, two-day festival last weekend to support the geeks-in-their-own-right Atlanta Radio Theatre Company, a nonprofit organization that performs works in radio show format: Sound effects, voice actors at upright microphones, even the occasional commercial or musical performance. I’m an occasional voice actor with the groups, and a member of the theater company member penned a 30-minute script that involved crossing dimensions, airships and romance – all frequent themes within the steampunk realm. That’s about what I know. Oh, and gears. There are lots of contraptions with gears. Not to mention steam. But then, I became the S.T.E.A.M.Fest 2012 Tea Dueling Champion. 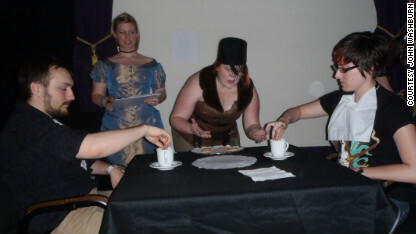 Lauren Berkley competes against her friend John Washburn in a "tea duel" at S.T..E.A.M.Fest, overseen by Tiffin Master Wilhelmina Frame. Yes, you read that correctly: Tea dueling. If “what the what? !” is running through your head right now, rest assured it was running through mine, at the time. I stumbled upon the duel by accident and then a friend volunteered me. And then I shocked the world. Or at least, the world of tea duelists. The duel – or “Tiffin Party” – was overseen by a Tiffin Master who told us to select our weapons – in this case, tea biscuits on a platter. For the remainder of the duel, we could only hold our biscuits between a thumb and forefinger. At the Tiffin Master’s cue, we dipped the biscuits three-quarters of the way into cups of hot tea, while the Tiffin Mistress counted to five. Each combatant then removed the biscuit with as little movement as possible, hoping to be the last one to get the biscuit completely in his or her mouth before it crumbled or broke. If that occurred, then a victorious “clean nom” was achieved. My final, clean nom against Sir John David Washburn’s flagging, soggy biscuit was enough to crown me victor! Or at least, “fez” me victor. Because fezzes are cool – and that was the prize. This game was much more fun than it should have been, especially for a group of people who were (mostly) sober. But I still didn’t really understand: What IS steampunk? And why? 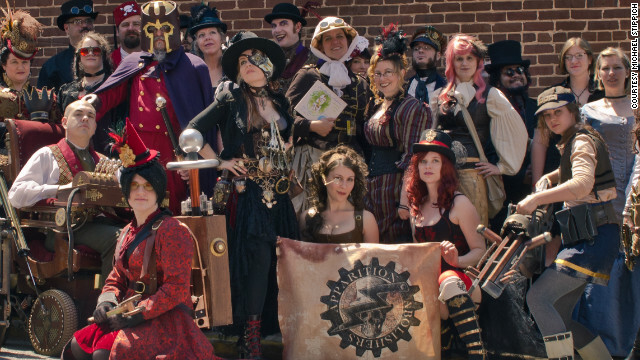 The lure of do-it-yourself is a huge component in the steampunk world, as most participants create their own costumes, props and weapons themselves. While it began as Victorian-era science-fiction, Doctor Quartermain, founder of steampunk community The Artifice Club, believes it is a “modern expression of a love for the past, with the clear intent of bringing the past into the future.” It's playing a "What If" with history with others, he told me, while being heavily focused on DIY. Matthew Silva, owner and co-founder of Penny Dreadful Productions, said it offers an open, creative playing field that’s still a community to be a part of. It also offers something few other creative aesthetics do: A family-friendly atmosphere. After immersing myself in steampunk all weekend, I left with a greater appreciation for it, but realized, too, why it just doesn’t “appeal” to me. For one, I am not a DIY-er. I act, I sing, I dance, I write, but I cannot darn a sock to save my life. I cannot draw, let alone work leather or metal or even plastics. I just do not have the time, money, and admittedly, the desire to even start the process in learning how to create, to build, to sew. The only thing required, according to the dozens I spoke to, is a love of “a time gone by.” That love spurs them to recreate a more courteous and more inventive experience in the present-day, by “modifying” current technologies with the deepest appreciation. For as long as I can remember, I’ve felt like I was born in the wrong era. My fashion, music, and film tastes all lean heavily toward the 1920s-1940s, so I can respect and understand the desire for a steampunk way of life. I might not be drawn to high collars, bustles, antique revolvers or steam-powered wheelchairs, but it sure is a lot of fun to time travel. After all, it’s not like dressing like a bloody, flesh-crazed zombie is for everyone, either. Thanks for your publiction. Another item is that just being a photographer requires not only difficulty in capturing award-winning photographs but in addition hardships in establishing the best camera suited to your requirements and most especially problems in maintaining the grade of your camera. It is very real and apparent for those photography fans that are into capturing this nature's captivating scenes - the mountains, the actual forests, the wild or maybe the seas. Visiting these adventurous places surely requires a digicam that can live up to the wild's severe setting. My steampunk friend told me it's one of the things that influenced him/gravitated him toward the steampunk world. I'll have to check it out, thanks! Great article Lauren! I have always been fascinated by steampunk. Have you seen the Castle episode about it? Thanks, Emily!! And yes, I *think* I have...I'm behind on the current season, but it was part of last season, wasn't it? In the cabaret-type club? Season 3 Episode 4 of Castle. He visits a NYC Steampunk Club. It is awesome. Next time you go, bring me with you!! I got to admit – I am a steampunk who does not make anything either. I am fortunate to know plenty of wonderful craftspeople though who through their hard work and my sourcing of thrift stores I have my Adventuring Lady outfit. I love Steampunk because it teaches us that the future is only the choices of the past and we can change it. In the Las Vegas Steampunk Tea Society we have everyone from children to Grandpas – there is no age. Honestly it's the one place I have seen people from all walks of life, religion, politics, gender and creed come together under a love of Yesterday's Tomorrow. I'm glad you learned a lot from this NaNo. I've had mriseable Novembers before where I don't feel like I learned much, and that's just so much worse. This sounds really good, despite not using it in the future. So well done! While there are many Makers within Steampunk you don't have to be one to enjoy Steampunk. Singing, dancing and writing make for a more than ample skill set to bring to Steampunk. As for being more in tune with the 20's and 40's, then maybe you should check out Dieselpunk. Dieselpunk is still retro-futurism but the technology is based on WW1 and WW2 instead of the Victorian age. Think tanks, submarines, Rosie the Riveter, gangsters, old-timey automobiles, that kind of stuff. One of our characters is based on the dieselpunk era and goes around with grenades strapped to him, and an anti-airship gun. Dragon*con can be a mob scene. I introduced my mom to Steampunk last weekend and this was a much easier way to do it. With quality entertainment for all tastes engaging round table discussions and fantastic venders there was a lot to see and do. It was quite a surprise to see you at STEAMFest, but I'm thrilled that you enjoyed yourself! It was quite a fun weekend, and I'm surprised about how many awesome people I have continued to meet in this community. Great meeting you, Lauren! Great work on the blog. Thanks so much for joining us. It was great to meet you, and I'm still desperately jealous of your fez! Hi very good web site you have established. I enyojed reading this posting. I did want to issue a comment to tell you that the design of this site is very aesthetically pleasing. I used to be a graphic designer, now I am a copy editor in chief for a marketing firm. I have always enyojed playing with information processing systems and am attempting to learn code in my spare time (which there is never enough of lol). I love steam-punk!! I'm too old to really participate.... I'm an old hippie. But I love the fashion!! Beautiful!! Great article!